Putin, the World Cup and Europe – more than a game now? As the World Cup plods along, Putin scores some goals of his own on the international arena. So where is Europe’s counter-strategy? Our regular contributor Luca Contrino is watching the tournament and wondering if this is the ultimate opportunity for Vladimir Putin to reinforce his interests around the world. The World Cup in Russia has so far proceeded without major incidents, and as well as Russia’s unexpectedly good performance, the hospitality offered has charmed many visitors and restored some of the country’s reputation. However, despite this event, the real show must go on and Putin knows this more than anyone else. Therefore, while Russia has played host to this major sporting event, Putin has set about business in the world and has scored some significant results that aim to strengthen Russia’s position abroad, in particular in relation to Europe. If European leaders are not careful, they might find that Putin has enough alternative avenues of revenue and influence that he can avoid future pressure from them. That is, if Europe’s leaders are still interested in applying pressure to Putin’s regime. Firstly, the new Italian government has loudly signalled its desire for “better relations with Russia” ( at least these are Giuseppe Conte’s words, roughly translated). In reality, Putin now has a devout pupil in the Italian government, the interior minister Matteo Salvini. True to form, he has alternated between his law-and-order rhetoric on migrants with intermittent screeching with regard to an end of the EU sanctions on Russia. Of course, that he campaigns on a law-and-order platform and then demands the end of sanctions brought against a country due to its military invasion and seizure of territory from another sovereign state is once again proof of his fundamental hypocrisy, idiocy, or both. However, it would be unfair to single out Italy as being a country that is uniquely willing to let Putin’s regime off the hook. With a cosy meeting between Putin and Austrian chancellor Sebastian Kurz in June (with Austria’s far-right vice-chancellor Heinz-Christian Strache also joining the chorus demanding an end of sanctions), and a weakened Angela Merkel in Germany (along with consistent support from Orban and other right-wing figures), one can begin to speculate whether European leaders will stick with sanctions once the discussion turns to their renewal. However, there are signs that Putin has scored important victories elsewhere, with many of those having a direct or indirect input from Donald Trump (whether he knew these moves could favour Russia or Russia’s advantage from them is a consequence that Trump didn’t consider remains an interesting point for discussion). First of all, Trump explicitly told rebels in Southern Syria not to expect help in the face of Assad’s troops. This has allowed Russian air strikes to batter their remaining positions, and the Syrian army has advanced rapidly as a result, and is close to reaching the Jordanian border once again. This is an excellent result for Putin, as it allows Assad to tighten his grip on the rest of the country and entrench Russian military positions, as well as reinforce Syria’s economic dependency on Russia for reconstruction and commerce, increasing the economically active area of the client state that is Syria for Russia’s exploitation. It also means neighbouring states or states involved in the Syrian conflict must pay attention to Russia when wanting to take action. Although perhaps surprisingly, the biggest win that Trump has gifted Putin is the trade wars he has decided to start with allies and major partners, including the EU, China, Mexico and Canada. Trump’s petulant approach to trade and diplomacy has worried traditionally reliable partners to the extent that unlikely trade partnerships are being negotiated. 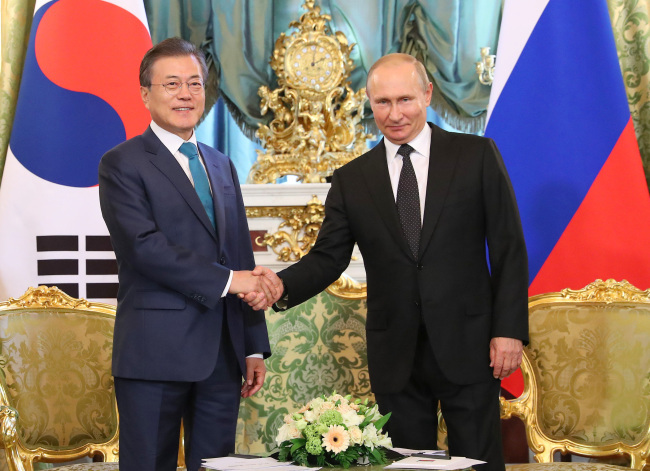 In Russia’s case, one of the most striking examples are the ongoing negotiations between South Korea and the Eurasian Economic Union (a group comprising Russia, Kazakhstan, Kyrgyzstan, Belarus and Armenia) to establish a free trade agreement, as reported by The Diplomat. This doesn’t sound significant in view of the nations involved, but in many ways it is a significant development, as the Eurasian Economic Union is an economic union devised by Russia which aims to counterbalance the European Union and the United States. Furthermore, this is also a turning point given that relations between Russia and South Korea have generally been cool. In South Korea’s case the long ties with the US and Russia’s support of North Korea even after the fall of the Soviet Union have led to widespread suspicion (as well as the historical ill-treatment of ethnic Koreans in the USSR), and in Russia’s case South Korea’s close ties to the US (and close military cooperation) have made it weary. To summarise, this is a significant shift in attitudes between the two countries, which could potentially take some pressure off Russia in economic terms, as well as reinforcing the idea of Russia, and by extension Putin, as acceptable economic partners at a time when Trump’s America offers no guarantees. In indirect terms, Trump’s tariffs have led to counter-tariffs that are likely to reduce trade between the United States and several key partners, and Russia is well-placed to fill certain market gaps that this could create. The biggest example is China’s decision to slap counter-tariffs on several US crops, including soy. This is designed to hurt US farmers who are a large part of Trump’s base, but the result has been a loss of market share in China which has looked elsewhere to replace lost imports. One of the world’s other major producers of soy is Russia. Considering that relations between the two are generally good, it is no surprise that China has looked to them to replace soy supplies, and other affected crops and foodstuffs. One must not forget that Russia has also been targeted with sanctions, more specifically on its steel industry. However, as these tariffs also apply to other partners, Putin can position himself as the reasonable adult in comparison to Trump’s petulance, and use a temporary difficulty in US trade relations with traditional partners to establish long-lasting large-scale trade cooperation that can increase Russia’s links outside its traditional sphere of operations, and give it more future partners in case relations elsewhere sour. Putin is also taking aim at Mexico (with which Russia already has considerable economic ties), having been one of the first leaders to congratulate Andres Manuel Lopez Obrador on his election victory, and along with the tariffs, Mexico has other reasons to dislike Trump. So what does this mean for Europe? First of all, Europe seriously risks losing the ability to put pressure on Russia regarding its foreign policy, especially its repeated meddling in European elections, and financing of European far-right parties. Additionally, despite the EU’s moves to establish free trade agreements with many of the countries alienated by Trump, the current nativist attitudes risk alienating investors and other partners, and risk the possibility of allowing Russia to move forward with other such deals with no competition elsewhere. The greatest problem, however, is the combination of several Putin-friendly right-wing governments and the tariffs from Trump that could force Europe’s hand and significantly ease or even lift sanctions. This would amount to nothing more than a reward for Putin’s repeated violations of human rights and international law, both within Russia and abroad. It would also signal to countries like Ukraine and Georgia that the violations of their territory and subsequent crimes will not warrant long-term negative consequences, which could risk these two countries looking elsewhere for security, and other forms of cooperation. Putin might not be “winning” just yet, and Russia remains in poor shape, but a series of events have gone in his favour, and given him breathing space which he was previously lacking. We must be under no illusions, all of this will have emboldened Putin, and this poses a risk of him upping the stakes for his next moves. Europe now has a serious choice to make. Keep the pressure on and attempt to contain Putin through economic and diplomatic means as much as possible, or wait to see to what extent he can strengthen Russia’s foreign relations, and what his next reckless moves will be. This should be a serious consideration, as recent history tells us that the latter point is not a question of whether it’s going to happen, it’s a question of when it’s going to happen.